Despite its hills, or maybe because of them, Pittsburgh is one heck of a great running town. Home to one of the largest marathon- and half-marathon events in the country, it boasts trails and scenic running routes for every type of runner. 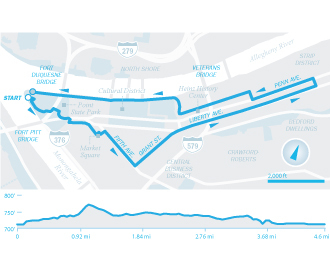 There are plenty of races coming up to give you a chance to test out these routes: There’s the Pittsburgh Triathlon and Adventure Race Aug. 13-14, the Great Race Sept. 25 and EQT Pittsburgh Ten Miler Nov. 6. New this year is the FlyBy 5K at Pittsburgh International Airport Oct. 1. This gently meandering riverfront trail follows the north bank of the Allegheny River. Start at North Shore Riverfront Park’s Great Lawn and Water Steps and head east past PNC Park toward Washington’s Landing, once home to slaughterhouses and now an upscale housing development. At the southwest corner of the island, take the ramp that crosses the back channel of the Allegheny. Keep going past Redfin Blues restaurant and the marina to the tip of the island, where a rocky overlook offers a spectacular view of the 40th Street Bridge, near where George Washington crossed in 1753. Follow the trail back to town, or cross the 30st Street Bridge and make a left onto River Avenue. If you’ve still got some juice, continue past the Great Lawn to Western Penitentiary. This part of the trail is beautiful at sunset/sunrise. Like hills? This loop from the Fourth Street Lot in the South Side to Grandview Avenue on Mount Washington will make your legs scream for mercy. But your eyes will thank you: Once on top, you’ll be treated to a spectacular panorama of the Pittsburgh skyline. From Fourth Street, head east on the Three Rivers Heritage Trail. Turn right on 18th Street, left onto East Carson and then left onto 10th. When you hit McArdle Roadway, turn right (you’ll pass George Cupples Stadium) and start your mile-long climb up to Grandview. After catching your breath (change of elevation is 600 feet) turn right onto Grandview and continue climbing and descending, past the Duquesne Incline (one of the oldest, continuously operating inclines in the world) to the apartment building at Republic. Turn around, and retrace your steps to Fourth. If you don’t mind another mile, continue past McArdle to the equally historic Monongahela Incline at the end of Grandview before circling back. There’s a reason Pittsburgh’s called the City of Bridges — more than 400 steel and concrete spans cross our three rivers and countless hollows. This run takes you across five, including the iconic “Three Sisters” that span the Allegheny River and link Downtown to the North Shore. Start at the Fort Pitt Block House in Point State Park. Take the ramp to the left of the museum across Fort Pitt Bridge (No. 1) and onto West Carson. Continue past Duquesne Incline to the walkway at West End Bridge (No. 2). Cross bridge and bear right onto Western. Make a right onto Brighton, left onto Ridge, right onto West Commons, left onto South Commons, then right onto Sandusky. Proceed across Andy Warhol/Seventh Street Bridge (No. 3), turn left onto Fort Duquesne Boulevard, then make a left onto Rachel Carson/Ninth Street Bridge (No. 4). Continue straight onto Anderson, right onto Stockton, slight right onto North Canal, right on East Ohio. Turn right on Chestnut (you’ll see the Heinz factory), and cross David McCullough/16th Street Bridge (No. 5) into the Strip District. Breathe deep before making a right onto Penn — the aromas wafting from Gaucho Parrilla Argentina’s wood-fired grill are intoxicating. 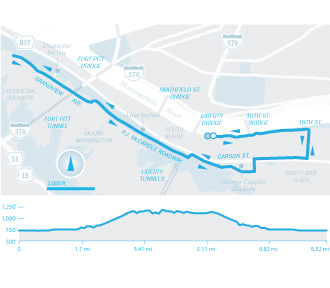 Either pick up the Three Rivers Heritage Trail in front of the convention center, or continue on Penn back to the Point. 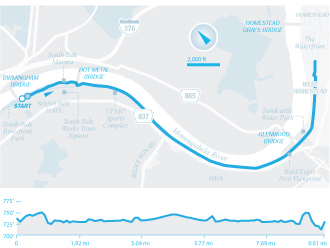 This scenic, out-and-back run along the Monongahela River begins at South Side Riverfront Park at the end of 18th Street (park beneath the Birmingham Bridge). Head east on Three Rivers Heritage Trail. You’ll pass the new South Side Marina (on your left) and South Side Works Town Square (on your right). Continue up ramp to the Hot Metal Bridge, built in 1887 to transport molten steel from one mill to another via railcar. Cross the bridge and go right onto the Eliza Furnace Trail (aka the “Jail Trail”) to the turnaround at Panther Hollow. 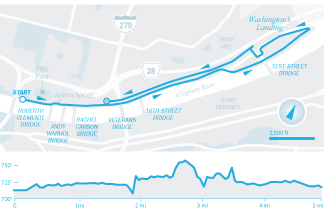 Or, ditch the bridge and continue on the Three Rivers trail past UPMC Sports Complex (where the Steelers train behind a big fence) and the bald eagles’ nest in Hays to the Waterfront in West Homestead. Forget about a negative split on your run back: You’ll want to stop at Hofbrauhaus’ beer garden to rehydrate. The best way to get to know a city is by running its streets. 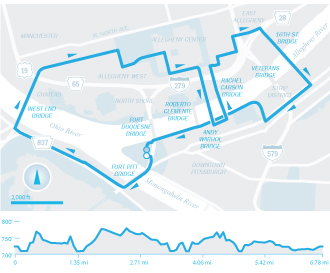 This run begins at the fountain at Point State Park, site of the original Fort Pitt and its predecessor Fort Duquesne. Head across the footbridge over the ornamental pool beneath the highway to Liberty Avenue. Make slight right onto Forbes into Market Square. Exit the square on Market Street onto Fifth Avenue. Turn left onto Grant Street (Pittsburgh’s government corridor) and follow to the Beaux-Arts Pennsylvanian apartment building on Liberty Avenue, built in 1898-1903 as the Union Station. Turn right on Liberty, left on 25th, then left onto Penn. As you run through the Strip District, make note of where you’ll eat/shop post-workout. Turn right on 15th, then left onto Smallman. Continue past Senator John Heinz History Center to 11th, where you can pick up the Three Rivers Heritage Trail in front of the convention center to the Point. Or take a left onto 11th then right onto Penn for a tour of Pittsburgh’s Cultural District.